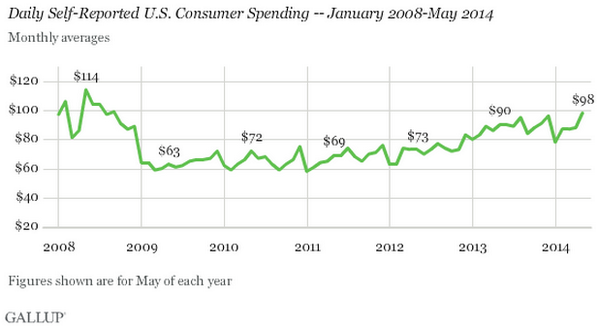 A few days back we posted this chart on Twitter that clearly indicates an increase in US consumer spending. One of the questions discussed was "how is this increased spending financed?". It's a fair question, given the painfully slow wage growth in the US. Unlike in previous Fed reports that showed consumer credit growth driven by student loans and to a lesser extent auto finance, we saw something new this time around. The increase was caused by a jump in revolving credit. Americans are warming up to using plastic again. This is certainly a positive signal because it shows that household confidence is improving sufficiently to send consumers shopping. Unfortunately a great deal of what Americans bought came from abroad, causing the US trade deficit to jump unexpectedly (see post). The effect on GDP growth from this jump in consumer spending will therefore be relatively muted.